The yeast that people have used for millennia to brew alcoholic drinks has now been engineered to produce cannabinoids — chemicals with medicinal and sometimes mind-altering properties found in cannabis. Researchers have produced anti-malaria drugs for commercial purposes, as well as opiates in the lab, using similar yeast-grown methods before. But the technology for making cannabinoids is nowhere near ready for market. David Kideckel, a cannabis analyst with AltaCorp Capital in Toronto, Canada, predicts that it will be another 18–24 months before synthetic cannabinoids are cost-effective enough to sell to either pharmaceutical companies or the general public. 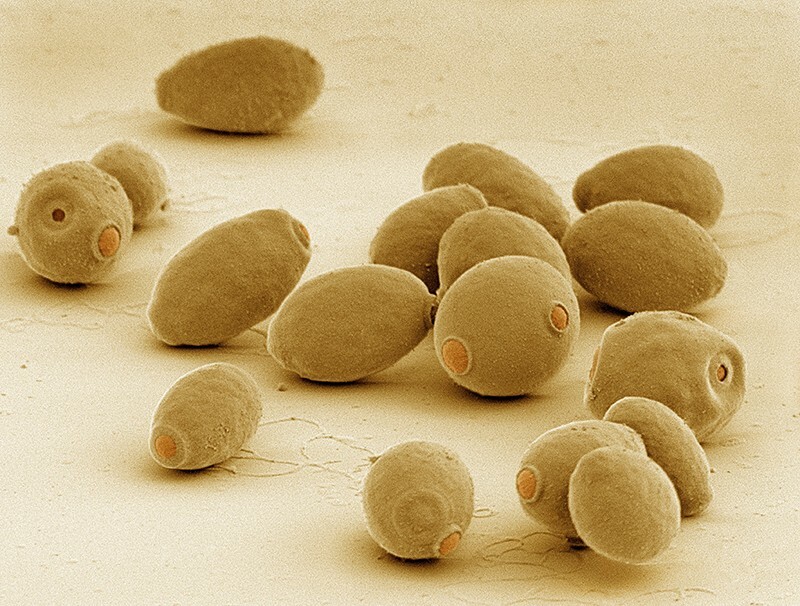 To build their cannabinoid factory in yeast, synthetic biologist Jay Keasling at the University of California, Berkeley, and his colleagues modified several genes found in S. cerevisiae, and introduced others from five types of bacteria and from the cannnabis plant. In total, they needed to make 16 genetic modifications to transform galactose into inactive forms of THC or CBD. Heating the cannabinoids switches them into their active forms. The team produced roughly 8 milligrams per litre of THC and lower levels of CBD. But those yields would need to increase by at least 100-fold for the cost to be competitive with plant-extracted cannabinoids, says Jason Poulos, chief executive of Librede, a company in Carlsbad, California, that holds the first patent on a process for making cannabinoids from sugars in yeast. Scientists at Demetrix, a company formed by Keasling in 2015 to work on this problem, have already boosted the cannabinoid yield of this process by several orders of magnitude, says Jeff Ubersax, chief executive of the firm in Emeryville, California. Keasling and his team have also been able to engineer their yeast to transform various fatty acids into cannabinoids that don’t occur in nature. It’s possible to screen these compounds for therapeutic properties; if any show promise, they could be patentable because they don’t occur naturally. That aspect of newly created cannabinoids could help to build interest among drug companies, few of which have actively explored cannabis-based medicines. “The pharmaceutical industry will really lap those molecules up,” says Vikramaditya Yadav, a chemical engineer at the University of British Columbia in Vancouver, Canada, who is working with InMed Pharmaceuticals in Vancouver to produce cannabinoids using bacteria4. But some argue that yeast-based fermentation might not be the best way of making cannabinoids. Toronto-based Trait Biosciences, for example, is genetically engineering cannabis to produce water-soluble cannabinoids for the beverage industry. They’re also trying to modify their plants so that every tissue, not just the resin glands that normally secrete cannabinoids, can produce novel cannabis-derived compounds. “Everything you can do in yeast, you can do in the plant itself with far greater yield and purity,” says Trait’s chief strategic officer Ronan Levy. And earlier this month, biochemist Jim Bowie of the University of California, Los Angeles, described5 a process for turning sugar into CBD without the need for the reactions to occur inside a cell. His team managed to produce a precursor to the inactive forms of THC and CBD in commercially viable amounts, and the researchers are aiming to develop the approach through a start-up called Invizyne Technologies. Luo, X. et al. Nature https://doi.org/10.1038/s41586-019-0978-9 (2019). Zirpel, B., Stehle, F. & Kayser, O. Biotechnol. Lett. 37, 1869–1875 (2015). Zirpel, B., Degenhardt, F., Martin, C., Kayser, O. & Stehle, F. J. Biotechnol. 10, 204–212 (2017). Kabiri, M. et al. Drug Deliv. Transl. Res. 8, 484-495 (2018). Valliere, M. A. et al. Nature Commun. 10, 565 (2019).